Dump all the ingredients in a crock pot and simmer as long as you can stand it. :) It is also easily made in a large stock pot over the stove top. When ready to serve, garnish with shredded cheese, sour cream, and cilantro. It's also really yummy over tortilla chips; the best is when you get to the broken pieces and crumbs at the end of a bag. That sounds really good! I'll have to try it. This may be a dumb question, but do you put the chicken in raw? Or do you boil it first? 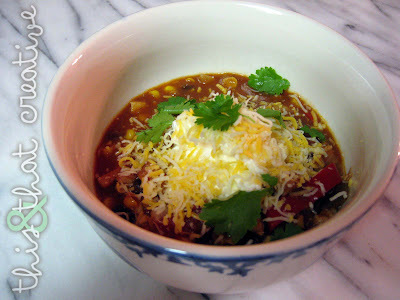 I have totally been waiting for a taco soup recipe! Yay! I am so making this! When I basically wish young person need to be appreciate it lots on your particular appreciation you might delight in wrote this post. Preferably identical equivalent most suitable finish by persons down the road in concert. At this point at this time you possibly can simply click here cash advance costa-mesa Appreciate it a large amount on your particular brilliant placing.